The home owners have reported numerous incidents of paranormal experiences. Ranging from sounds, voices, photographic anomalies, feelings of being watch and even a full body apparition. (audio1, audio2, audio3, audio4, audio8, audio9)They have had sightings and feeling of an old man in a green shirt, a young girl in a 70's version tube top, a middle aged woman and a Native American Indian. The oldest property record dates back to a deed dated in 1900 with additional documentation updated in 1908. There was no name associated with the property on these documents. Further investigation of records shows that in 1914 the residence was owned by a male until the 1950's. The residence is located 792 feet above sea level, near a major waterway and 875 feet from a large bank of electrical transformers and power transmission lines. In the preliminary meet and greet with the client, it was discovered that do to the close proximity with the power generating facility, high amounts of ambient EMF were present throughout the house and of course the surround neighborhood. These massive EMF fields created a situation where it was nearly impossible to be able to use our EMF meters to conduct experiments. Before the investigation, an initial sweep of the general surrounding location of the residence was conducted, we measured ambient amounts as high as 20mG throughout the neighborhood. Internal to the residence, measurements of 2mG to 5mG were prevalent throughout. The team broke up into investigation units consisting of Jason and Val, Sarah and Kim, and Kurt stayed at the command center to coordinate the teams, log personal experiences and monitor the weather tracking system. The investigation started promptly at 10:06pm. The residents were present for the initial EMF sweep and then left for nearly two hours during the main portion of the investigation. The INPR groups started the investigation by saying the Prayer of Saint Michael and we went lights out. Jason Snyder and Valerie Bontempo started in the basement where EMF levels were up to 5.0mG throughout the basement. Sarah Neher and Kim Daugherty took the first floor and started in a child's bedroom and conducted a standard EVP session. It did not take long for us to start capturing paranormal data. Only 15 minutes into the investigation, a massive personal experience was shared by the whole six member team. What makes this so astonishing is that the team members were actually in 4 separate locations within the house. From Kurt's vantage point at the command center, he could see one team member sitting outside the hall filming Sarah and Kim doing an EVP session in a child's room. What was heard from all 4 members on the first floor, was footsteps walking down the long hallway towards the basement door. Down in the basement, Jason and Valerie had take up position in the main area about 5 feet from the stairs. What they witnessed was truly chilling. From Jason and Valerie's vantage point, they heard the basement door open. They then saw light illuminating the wall in a manner consistent with ambient light trickling in from the kitchen just outside the doorway, then the door closes. Then the basement steps began to creak as if a full sized person was walking down into the basement. Jason whispers a team member's name. Nothing. Then two more loud distinct creaks out of stairs, Jason comments to Valerie, "that better be him after that", and then calls the team member's name in a louder voice, no one was there. Here is the audio recording of this event. (insert Jason's EVP). At 10:46 Jason and Valerie came up from the basement and switched places with Kim and Sarah. However, even with the change in locations, the paranormal activity was still happening. Back in the basement, Kim and Sarah conducted another EVP session. They were asking standard questions, one specific question Kim asked, "do you like it in the basement", she got a loud and clear answer. A small girls voice came from the corner of the basement, "not really". (listen) This response was heard by all three members in the basement as they did their best to figure what made the sound. Later in the basement, they captured this EVP, apparently something was trying to get their attention. Up on the first floor, Jason and Valerie were in the master bedroom, Jason felt something and started snapping pictures in the general direction. In the frame was an alarm clock which displayed an interesting anomaly. As we reviewed the photographs, not all of the numbers that were being displayed were showing up. Only certain numbers. Here is Kurt's account of what was happening. After their EVP session was complete, Kurt and Sarah did an EMF analysis of with MEL-8704 and measured localized EMF in contact with the radio at over 200mG. Readings were photographed by Sarah at over 140mG. (insert Sarah's high EMF readings here). While Jason and Valerie had moved into the children's room, they conducted an EVP session. Jason was asking for proof that something was there, he got it! Listen to this clip of the response. Shortly after this time at approximately 11:30pm the team met at the command center to discuss and review further experiments. It was during this time, that for a period of 4 minutes, the weather logging station recorded some compelling evidence. Throughout the night the system had been running and logging all the environmental variables that we are studying. Internal temperature, external temperature, dew point, relative humidity, barometric pressure, wind speed and wind direction. The system was set to monitor and log data every 30 seconds. 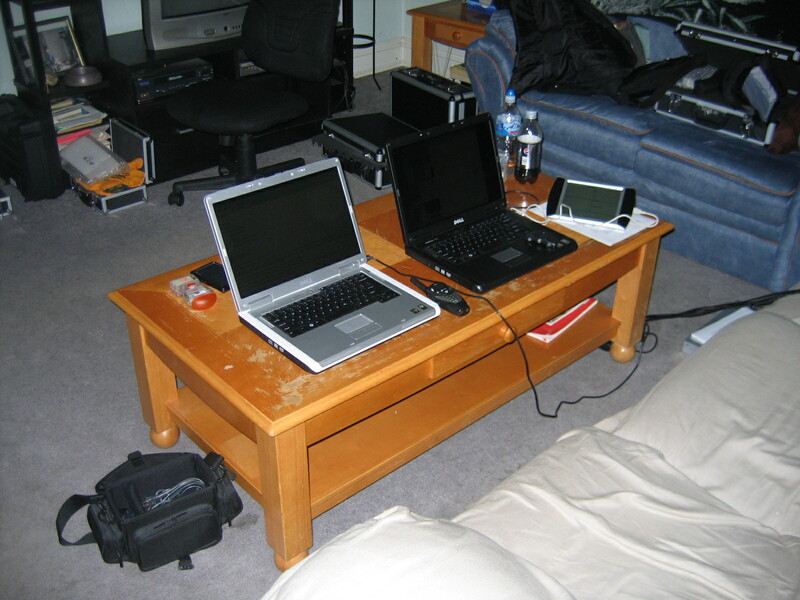 The internal sensor array was stationed at the table where the command center was in the living room and the external sensor array was out on the back side of the house approximately 60 feet away. Throughout the night, for nearly 2 hours, readings had been very consistent on all variables. Until 11:35:30, then all variables rapidly changed. The internal temperature of the living dropped from 70.4 to 69.1 degrees F. This change happened very rapidly and stayed that way until 11:39:30, exactly 4 minutes. This in and of itself is not of great significance and could be explained several different ways, however, the following two simultaneous instances cannot. During this same 4 minute period, the external temperature which has been steady for the two hours, went from 34.0 to 67.3 degrees F. The outside temperature increased 33.3 degrees F in less than one minute. And at the same time, the barometric pressure which had been holding steady at 29.551 - 29.557 in/Mg dropped. The lowest reading recorded was 29.202 in/Mg. At 11:39:30, after 4 minutes, all readings returned to normal and did not deviate for the rest of the evening. What happened during those 4 minutes? At about 11:45 the residents returned. At 11:50pm the teams split up again, now adding one resident to each team, and conducted an ultra quiet observation time in order to get a complete feel for the residence. At 12:05 Sarah and Kim commenced a second EVP session in the Master bedroom. At 12:20am the team of Jason, Valerie, and another team member finished up the EVP session in the basement. During this whole secondary investigation time, that included the residents, nothing was captured. Nothing. During this investigation, In Nomine Paranormal Research was able to identify and capture evidence that confirmed the residents suspicions. Throughout the night we were able to show instances of a little girl and an adult being present in the house. At the reveal, the residents were very happy that we were able to find these personalities and record some of their antics. From this point, the INPR team asked them, what would they like us to do? Should we work towards ridding the residence of these spirits or would they like to make additional communication with them. The residents feelings were that they wanted to keep them, and to know more about them. They have challenged us to find out additional historical evidence that can lead to the identity of the young girl. With that pledge in mind, INPR is going to embark on a subsequent investigation, sometime in the Fall of this year, employing the expertise of one of paranormal research's most respected psychics. In Nomine Paranormal Research is proud to have provided this valuable insight to the residents and to the paranormal research community in general.